Electricity is one of the most forgotten about elements of a business…that is, until it’s not available. There are so many businesses out there that wouldn’t survive a second without electricity. That’s why it’s so important to have a generator installed – to provide power back up when there is an outage, broken fuse or any other glitch. Installing generators in the right way guarantees you of consistent productivity especially during blackouts when other businesses get ground to a halt. You also get peace of mind with regard to the security of your business premises during storms and power outages. A generator is not meant for emergencies only. They are meant to ensure that you have a constant power supply regardless of a power outage or not. If you want to enjoy these benefits and so much more then you’ll definitely have to call in Hotwire Electric. We are experts in generator installation and placement. With a professional electrician, you can rest be assured that your generator will be properly installed. Our services are cost effective (with no hidden costs), completely safe and secure. That’s not all, other than offering residential and commercial installation of generators, we also offer maintenance and repair services, transfer switch repairs and replacement, site surveys (to assess whether you need an elevated platform or not) as well as generator testing. To avoid dangerous situations such as electrocution or back feeding, call in a Kelowna electrician. Regular generator maintenance protects your investments. Let’s just face it, a generator is expensive to acquire – leaving it in a state of disrepair can result in further damage and might even lead to complete replacement of the system. 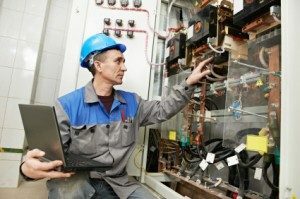 In addition to this, running a generator that is not 100% effective may cause complications to other machines connected to it. All in all, we cannot emphasize enough how crucial it is to have an expert service your generator. During residential installation of generators, we as professionals face a number of problems which can altogether be avoided. Time is money and when you create an environment that is difficult for us to work then we both lose. The common problem our electricians face is hostility from out clients pets and in particular dogs. If you are a dog lover then please take them out for a walk or have somebody sit them. One more thing, it is very convenient for you to clear out the garage (move your car, boat, motorcycle etc.) before our electricians get on site. With these two in check then all is set. Whether you are looking for an electrician you can trust to advice you on the type of generator you need, installation of the same or maintenance then you have a partner in us. You can contact us via email or telephone and we will get back to you. Contact Hotwire Electric now.